View from Chapramari Watch tower. Chapramari Wildlife Sanctuary (formerly Chapramari Wildlife Reserve, pron: ˌʧʌprəˈmɑ:rɪ or ˌʧæprəˈmɑ:rɪ) is close to the Gorumara National Park. Chapramari is about 30 kilometres from Chalsa and Lataguri in northern West Bengal, India. The total coverage of the forest is 960 hectares. In 1896, an imperial forest-service administrator D.H.E. 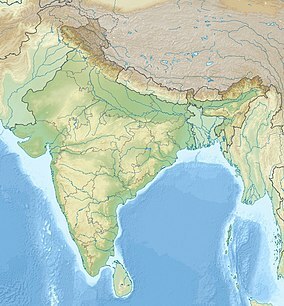 Sander first sent a proposal to the-then English-dominated Government of India that Chapramari could be developed into a tourism centre. The area was declared a national reserve forest in 1895 under the Indian Forest Act. In 1939, the name Chapramari Wildlife Reserve came to be used, while the Government of India, in 1998, gave it the status of a national wildlife sanctuary. The name of the region comes from 'Chapra', a variety of small fishes found in northern Bengal, and 'Mari', meaning 'abundance'. Chapramari receives waters from the Teesta, the Neora, and the Murti. A large variety of flora and fauna are found in the forests. Chapramari is known for its elephant population. Gaur (commonly known as Indian bison) are not uncommon in the Chapramari region. Rhinoceros, Deer, boars, and leopards are also found there. However like Gorumara Royal Bengal Tiger are not found here. The place is popular with bird watchers, with parakeets, kingfishers, and green pigeons found in abundance. In 2009, a marauding leopard was captured in Dooars and released into Chapramari. Malbazar Rail Station is the closest rail hub. Chapramari is located around two hours' drive from Siliguri, the principal city in northern Bengal. The access from Jalpaiguri passes through the dense forests of Batabari range. Due to complications caused by monsoons, the wildlife sanctuary remains closed each year from mid-July to mid-September. West Bengal Forest Development Corporation Limited operates a Chapramari camp. The wildlife sanctuary is crossed by the railway line between Siliguri and Malbazar. Elephants have been killed by trains in several incidents. On 2002 February 8, a Siliguri-Alipurduar train killed one female elephant and injured two tuskers. An accident which killed seven elephants in 2010 led to a guideline speed of 40 km/h (25 mph) for trains being set by Indian Railways. At approximately 17:40 on 13 November 2013, an Assam-bound passenger train travelling through Chapramari Wildlife Sanctuary, Jaipur-Kamakhya Kavi Guru Express (19709), approached the Jaldhaka River Bridge at approximately 80 km/h (50 mph) and collided with a herd of 40–50 Indian elephants, killing five adults, two calves, and injuring ten others. Surviving elephants initially fled but soon returned to the scene of the accident and remained there until being dispersed by officials. The accident has been described as the worst in recent history. Officials plan to launch an investigation into its cause. The train's speed at the time of the collision, which was double that of the maximum specified by relevant guidelines, has been noted as one possible contributing factor. Minister of State for Railways Adhir Ranjan Chowdhury stated that the accident "happened outside the area which has been earmarked as elephant corridor" and that it "is the responsibility of the state government to protect the wildlife [because] railway officials cannot". ^ "Tourism". Jalpaiguri Municipality. Retrieved 2013-11-20. ^ a b c d e f g h i j k l Sengupta, Somen (2012-11-11). "Call of the Wild" (PDF). The Statesman. p. 5. Retrieved 2013-11-20. ^ Chakrabarti, Chinmoy (2007-08-12). "Next weekend you can be at ... Paren". The Telegraph. Retrieved 2013-11-20. ^ "Recaptured leopard released into West Bengal sanctuary". ANI. News Track India. 2009-07-26. Retrieved 2013-11-20. ^ "Chapramari Wildlife Sanctuary". Wild Trail in Bengal: Travel Guide. Mitra, Swati. Goodearth Publications. 2011. pp. 62–63. ISBN 978-9380262161. ^ "Elephant hit by train dies". The Times of India. 2002-02-12. Retrieved 2013-11-20. ^ Sarkar, Debasis (13 November 2013). "'Railways Killer track' again kills 7 elephants in West Bengal". The Economic Times. Retrieved 14 November 2013. ^ "19709/Jaipur-Kamakhya Kavi Guru Express". India Rail Info. Retrieved 14 November 2013. ^ a b Banerjee, Manik (14 November 2013). "India Train Crash Kills 7 Elephants". Huffington Post. Associated Press. Retrieved 14 November 2013. ^ Withnall, Adam (14 November 2013). "Speeding train kills at least seven elephants and injures 10 others in India". The Independent. Retrieved 14 November 2013. ^ Banerjee, Manik (14 November 2013). "Train Mows Down, Kills 7 Elephants in East India". ABC News. Associated Press. Retrieved 14 November 2013. ^ a b "6 elephants killed by train in India's West Bengal state". United Press International. 2013-11-14. Retrieved 2013-11-15. ^ "Overspeeding trains ran over elephants: Bengal minister". Press Trust of India. First Post. 2013-11-14. Retrieved 2013-11-15. ^ Ghosh, Shubham (2013-11-14). "Train rams into elephant herd in North Bengal, 7 jumbos killed". One India. Retrieved 2013-11-15. ^ Dinda, Archisman (2013-11-14). "Blame game over elephant death in West Bengal". Gulf News. Al Nisr Publishing. Retrieved 2013-11-15.